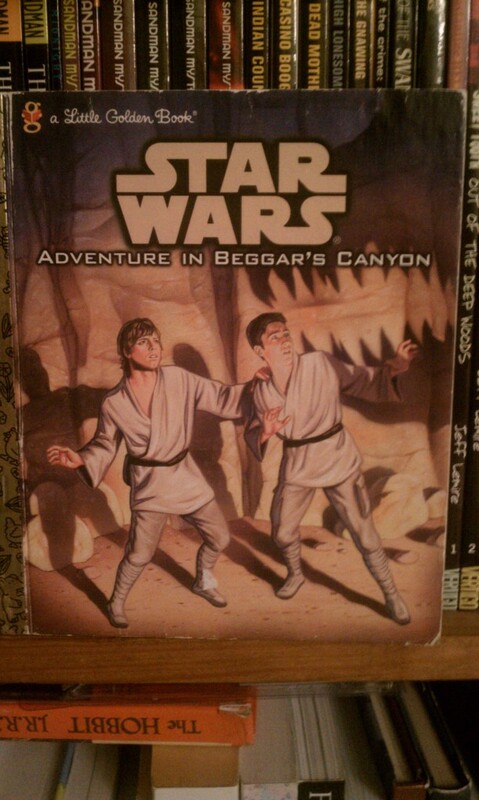 Today we’re looking at Star Wars: Adventure in Beggar’s Canyon, published by Golden Books in 1998. It was written by Jane Mason, with artwork provided by Gary Ciccarelli. Just a quick note: I owe y’all one comic from this week (allergy attack!) but besides that one, no comics next week. I’m on spring break. I will be posting some sketchbook stuff and perhaps a run-down of a comic book show I’m attending this weekend. Besides that, my plans are pretty tenuous. Visit with my mom, perhaps sleep in a day or two. If I get those things done, Spring Break 2012 will have been a roaring success. 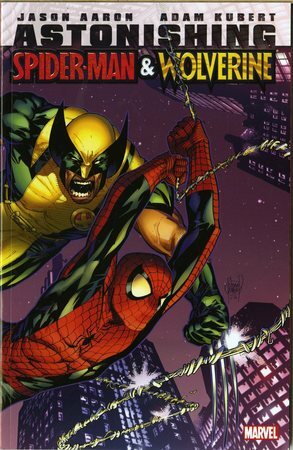 I recently picked up a hardcover copy of Marvel Comics’ Astonishing Spider-Man and Wolverine for my classroom. I’ve been pulling back from ordering straight-up superhero collections for my classroom of late. I love ’em, the kids love ’em… but I already have quite a few. I made an exception on ASM&W for a couple of reasons, but chief among them was the books’ writer. I’ve enjoyed Jason Aaron‘s writing in the past (specifically on his Vertigo series Scalped) but many of my students went crazy over Aaron’s run on Wolverine a few years ago, when my friend Delano donated a bunch of single issues to the library. I thought it would be nice to have a hardcover collection of the writer’s, given that his work was such a hit in issues. Aaron works with penciller Adam Kubert to bring two very disparate characters together for a time-spanning, dimension hopping adventure and the duo produce some really fun comics. Aaron comes up with some crazy ideas (Doom the Living Planet! The Phoenix Gun!) and Kubert executes them handily. It’s goofy, rollicking stuff. The problem is… the work doesn’t collect well. By that I mean… the work collected in this hardcover is CLEARLY six individual issues of a comic, with some through lines in regards to plot and character. It is not one gigantic, cohesive story really. That’s not a slight! I like reading individual comic books, more than I enjoy reading trades. I bet ASM&W read wonderfully well in six chunks. When you bind them all together however… it seems scattershot. I like to think I’m not one of those fathers who crams his interests down the throats of his children. So often, I see parents who INSIST their sons and daughters love the same things they love- I’m thinking specifically of those moms and dads who outfit their kids head to toe in clothes lionizing their favorite professional sports team. I worry that I’m going to be like the parent described in this hilarious news piece from The Onion. I say that because, emphatically, I want you to believe I did not plan on having my sons become obsessed with He-Man and the Masters of the Universe. Sure, I have exposed them to the property a couple of times… but I had never gotten around to showing them the animated series, despite it being readily available for streaming on Netflix. I avoided this because, real talk, the cartoon is HORRIBLE. Filmation, the animation studio who produced MotU, was masterful at cutting corners with the show. The same ten or twelve stiff cycles of animation are used over and over again, applied in slightly different ways. I honestly don’t mind the rotoscoping, but when the same sequence is repeated three times in a 22 minute period? Forget it. The stories are dumb and rarely make up for the limited animation, although the handful of episodes written by scribe Paul Dini prove the exception to the rule. Dini’s contributions are the least intellectually insulting and offer a fair amount of characterization. Of course, those limitations didn’t deter me from loving the cartoon as a child and it hasn’t stopped Elliot or Henry either. 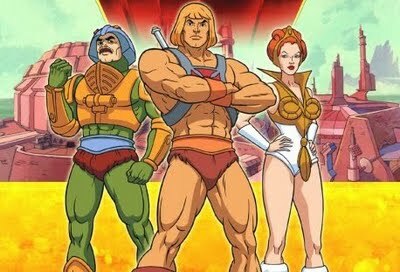 On a lark, I showed them an episode and told them, “This is what Daddy used to like when he was your age.” The fervor with which they’ve taken to He-Man and company has, quite frankly, surprised me. They spend long afternoons in the backyard, swinging sticks around and yelling “By the Power of Greyskull!” They’ve been playing with my old MotU toys like crazy. They’ve started requesting He-Man stories at bedtime, including these two previous Thrift Store Finds. It’s a little weird, seeing my kids so invested in something I loved so much back in the day… especially given the adult realization that the show is pretty shoddy. Despite that, I have to admit… there does seem to be some essential aspect to the cartoon that makes it appealing to kids, both yesterday and today. This comic somewhat mirrors an early strip I did in this run. 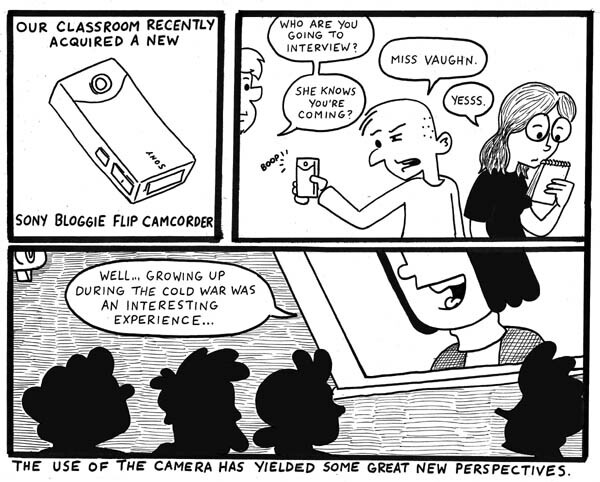 I thought doing a bunch of these “talking heads” strips might be an interesting idea… until I remembered that this is not an original idea. Cartoonist Alex Robinson used to do these during his run on Box Office Poison. I always liked the talking heads bits, as they directly revealed things about the characters in the story that might have otherwise gone uncovered. Boy, I’ve never had this happen to me before, but I got home from work yesterday and was hit with one hell of an attack on my sinuses. It was so bad, I took the day off from work today to sort of recover… most of which involved laying in bed and watching old episodes of Mystery Science Theater 3000. Apologies for skipping out on comics. 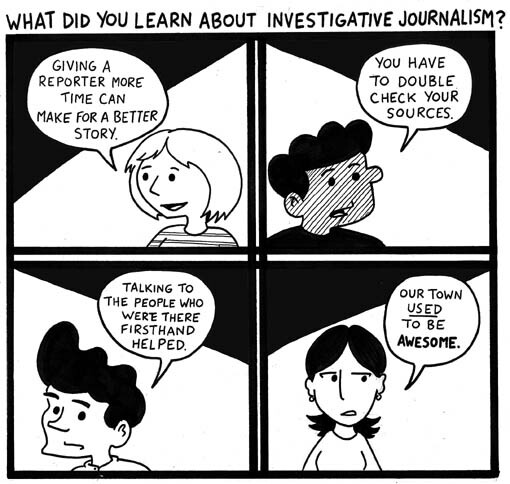 I’ll have a new one tomorrow and make up the last one in the epic “investigative journalism” run of strips sometime next week. The Bloggie does the job, but I’m afraid it’s no substitute for the easy-to-use and easy-to-maintain Flip. Unfortunately, I don’t think they’re making Flip cameras anymore. 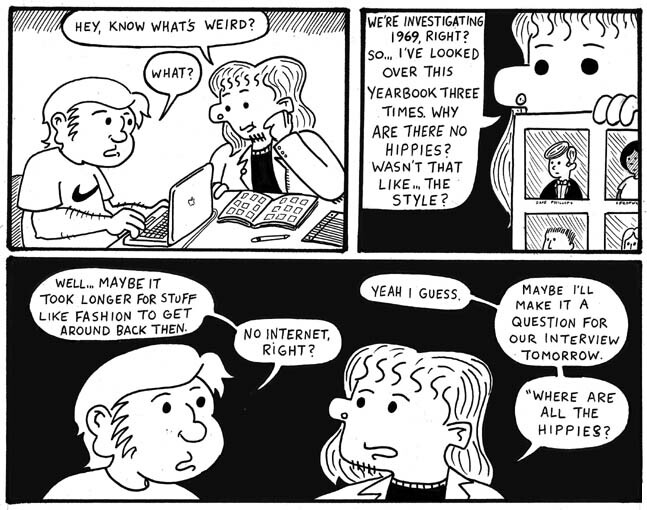 2011-2012 school year: whither hippy? No chalkboard drawings for this week, folks. With the Ohio Graduation Test going on, there was no place for frivolity… or ANY kind of materials on the walls or boards. 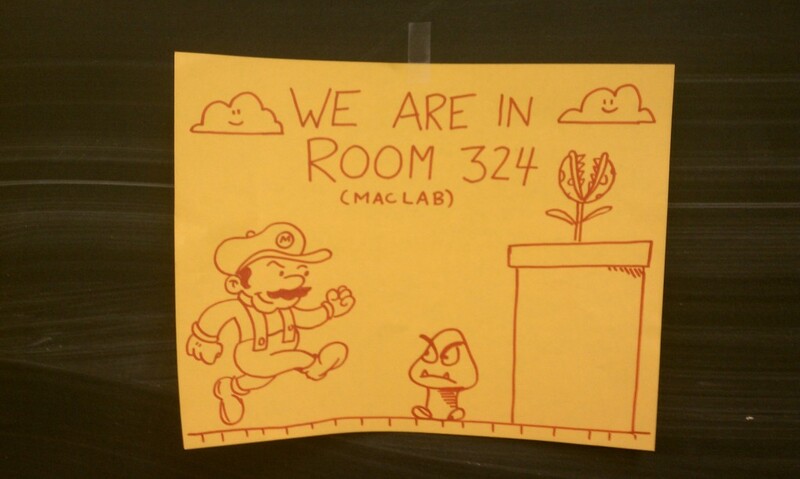 I had to spend like an hour covering my walls with newspapers, so as to obscure any work that might give test-taking students an unfair advantage on the exam. You are currently browsing the Teachable Moments blog archives for March, 2012.